A tidy two bunk bivvy with an open fire. The bunks have thin closed cell foam mattresses rather than thicker DOC mattresses with fireproof covers that are the norm in most DOC huts. 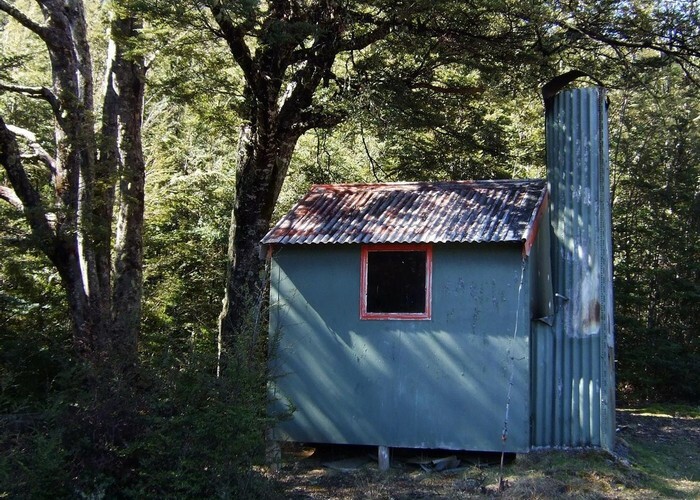 This bivvy was built by the NZFS in 1962 for use by hunters. It still has its NZFS hut number fixed to the outside of the door. Turnbull Bivvy Sept 2015 • By glennj. Licence: C.
From the Poulter River. A poled route starts WSW of the bivvy at the mouth of the un-named stream that bisects the bluffs. Note that this is not Turnbull Stream but the next one further north. Fording the Poulter in this general area is ok unless it is in flood from rain or snow melt. Added 14 September 2015 by glennjglennj. No revisions. 175 views in the past year (15 per month).